To make an image larger just Click on it. Lee was born in Penzance and after leaving school, trained in painting at Falmouth and North Staffs University. For several years he worked in a variety of jobs but it was not until a return to his home town that he took up printmaking under Sue Lewington at Penzance School of Art. 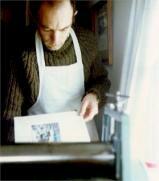 Lee now enjoys working in a range of media including charcoal, oils, linocut , etching and mono-printmaking. His work is primarily a response to the West Cornwall landscape which he loves, but more recently he has also taken to the human figure as a subject.